Have you ever idly watched someone walk by and, without even realizing you’re doing it, you’ve created a whole story about them just by what you see? Jerry Nagel and I realized we were doing just that one day recently while at a stop light. A woman was walking across the street in front of the car. Silently, we watched her cross. Catching ourselves doing it, we looked at each other and laughed. We recognized that, in a nano-second, we had each climbed the ladder of inference without a conscious thought – taking in how she was dressed with flip flops on her feet, a tank top, tattoos on the back of her shoulders and smoking a cigarette. 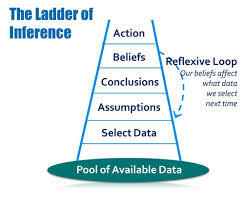 The ladder of inference, which comes from systems thinking, has been brought into the work of Worldview Intelligence because it helps us understand how we reach conclusions about our experiences. What we react to is not what is right in front of us; it is our interpretation or the story we make up about the situation. We look at someone, a situation, an event and without even articulating it in words, we make up stories about what we see or experience. It is preverbal. This is what we do – as human beings – all the time. There is a lot of data in the world – more than we can possibly, reasonably take in. In the age of technology and internet searches we have unprecedented access to information or data – which does not equate to wisdom or knowledge – just data. Of all the data that is available to us we must, by necessity, select data or be paralyzed with overwhelm. We are largely unaware of the criteria we use to select data. It could be that, just in glancing around a room or an environment, we are randomly selecting what comes into our awareness and what doesn’t. It could be that a question, an inquiry or a purchasing decision will help us focus on and select data pertinent to the inquiry. As we select data, we make assumptions about that data – that it is correct, that it is informative, that it is accurate, that it serves our needs. It could be that this is true and, even if it is, it is the beginnings of the story we are making up, telling ourselves to interpret or make sense of our experiences. From the assumptions we make, we draw conclusions. We decide something is good, or bad or indifferent, helpful or not, true or not. We make judgments with greater and lesser degrees of awareness. When we have drawn the same or similar conclusions over and over again on a subject, it becomes a belief. This belief may or may not be backed up by “fact”. Fact is in quotation marks because people who are prone to thinking logically – which most of claim at some point or other – imagine that there are “true” facts. If we just pay attention to those facts, we would all reach the same conclusions. This is clearly not the case when you look at scientific research, climate change or political views to name a few contemporary contentious issues. Many people can look at the same set of facts and interpret them radically differently, partly because our beliefs begin to influence the data we look for, partly because we shut out things that our inconsistent with our perspective and partly because so much of our response is on automatic. The different interpretations of data can become entrenched perspectives or points of view that, when challenged, we choose to defend rather than open up to inquiry. The more defensive we become, the harder it is to open up or expand our point of view, to let in disconfirming data, acknowledge that other points of view may also have as much validity as our own. If we look at disconfirming data at all, it is so we can counter it with our own arguments and facts. The conclusions we reach, supported by our beliefs, inform the action we decide to take. The same conclusions over and over again, likely reinforced by the people around us since we largely interact with people with similar worldviews or perspectives – begin to create generalizations about situations, people, perspectives. Whether we support climate change awareness initiatives or dismiss them. Support local economies or source the least expensive goods possible. Whether we become politically active or not. Whether we take certain jobs, live in certain places, send our children to certain schools or not at all, our choice of programming that we watch, whether we automatically act differently towards people of different skin colours, group affiliations, ages or neighbourhoods, whether we change our behaviour or not. The list goes on and on. All of this is great if it serves to simplify our decision making processes about routine kinds of things – decisions to get dressed in the morning before heading out, the route to work, routine shopping and more. It becomes problematic when we become aware that we are automatically ascribing characteristics, motivations or judgments about a person, group or situation without having thought it through. This becomes a self-reinforcing loop. The more we work it, the narrower our worldview or perspective becomes. We actively create stories to make meaning of what happens to us all the time. The story telling is influenced by our worldview and influences our worldview. Sometimes it reinforces our worldview and sometimes it updates it. An updated worldview does not mean we lose the things more important and core to us. It does mean that we create the opportunity for points of connection which can radically change the conversations we are in and create the opportunity to move forward on issues that matter to all of us. The stories we create may or may not even be resonant with our own life experiences. We are really good at leaving out (not seeing) that which does not resonate – making it, or ourselves, an exception. Jerry and I both have tattoos that form part of our own experience. And yet, that woman crossing the street? Her tattoos caught our attention in a way that was not so resonant with our own experiences of having tattoos – maybe because of other elements we took in that comprised the whole about which we were silently telling the story. The next time you find yourself idly watching someone walk by, stop and notice the story that is silently forming in your mind. See what judgment or assessment you might be making about the person, group or situation. Then allow yourself to become curious about how you climbed the ladder of inference to come to those conclusions. You might be surprised by how prolific the stories are that you tell about others and about yourself. Maybe, as we become more intentional about expanding our worldview, everyone benefits. Including us.